We are so excited to introduce you to the completed effort of the DAR Constitution Hall stage restoration! If you weren’t able to see the reveal of the renovated stage live on Facebook, you can watch the video here. After the completion of Phase One of restoring the Constitution Hall lobby, Phase Two focused on the stage and the iconic visual aspects that have been the backdrop to DAR Continental Congress as well as hundreds of thousands of concert-goers annually for close to 90 years. The main goal of the restoration was to enhance the stage’s historic character while ensuring that Constitution Hall continues to successfully host a variety of major shows and events as a modern performance venue with functional adaptability. A key element to the meticulous work was restoring the stage back to its original appearance. The stage now more closely resembles the original design that audiences were introduced to when Constitution Hall first opened its doors in 1929. Notable neoclassical architect John Russell Pope designed Constitution Hall along with other iconic buildings in Washington, D.C. including: the National Archives Building, the National Gallery of Art, and the Jefferson Memorial. 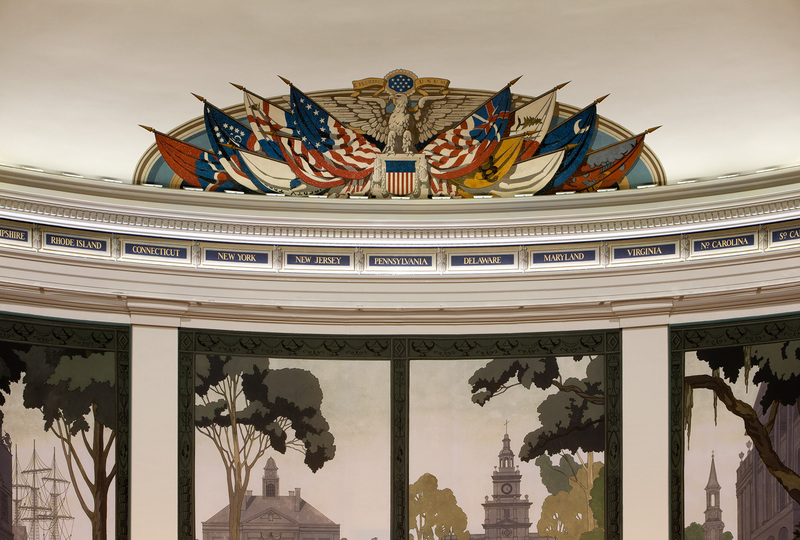 When the Constitution Hall auditorium first opened, it featured a pale palette that highlighted the colorful canvas flag mural in the dome above the stage and a decorative four-panel curtain painted with historic American Revolution era scenes. The stage had a medium-tone longleaf pine floor with decorative marble and plaster details. As time went on and technology changed, a series of renovations altered the historic fabric and aesthetics of the space. The auditorium’s advanced age along with being a popular venue caused a buildup of layers of dirt and smoke, as well as typical wear and tear such as damaged wood, plaster and marble, broken and unstable stanchions and railings at the marble steps, and peeling and flaking paint. Now that we’re able to show you the brilliant final product, let me take a step back and highlight the incredible work that went into this restoration. DAR partnered with The Christman Company and Quinn Evans Architects to develop the strategy and implement the seven month restoration project. Special attention was made to compressing the timeline (which was originally longer) in order to keep to keep work scheduled so Constitution Hall only had to go dark (no shows) for two months, helping to ensure the restoration only minimally disrupted the busy performance schedule of the Hall. Quinn Evans performed an intensive survey to document the existing conditions and develop repair and restoration treatments. In collaboration with conservators and artisans, this team worked meticulously to bring new life to our historic stage. The scaffolding alone was an engineering feat in itself, because of the grand scale of the work and the various nooks and crannies that need to be accounted for in order to facilitate easy access to the targeted areas, while free-standing from the walls. The custom design needed to be built at very specific height levels in order to allow the conservators to work in comfortable positions for long durations of time. The scaffolding was constructed in three days and covered the entire expanse of the stage and 40 feet high to the ceiling. Many subtle enhancements were made that contribute to the overall impact of the restoration. There were plaster repairs and paint removal, and after a historic paint analysis of all the painted surfaces by Artifex, Ltd. revealed the original colors of John Russell Pope’s work, a fresh coat was given with a neutral palette. The medallions that flank the stage on either side featuring the DAR Insignia and United States Seal received a decorative paint scheme with subtle gilding. The stage flooring was sanded, repaired and given a darker stain. The marble base at the stage along with the marble stairs and railings were repaired and cleaned. The stanchions were refabricated to match the existing. Several inconspicuous elements were also added to increase the stage’s durability, such as faux-marble painted steel corner guards to protect the marble column bases at the edge of the stage. The stage apron (the part extended into the seating area) was, for the most part, returned to its original design aesthetic, but instead of using plaster, as the original design had called for, hardy glass fiber reinforced gypsum (GFRG) was used to create the panels. The pilasters between the acoustical panels were given new GFRG capitals to restore the original aesthetic. The flag mural in the dome, along with the original 13 state name murals which are a band just below the upper cornice, are actually painted on canvas adhered directly to the plaster of the dome and cornice with adhesive and small tacks. The canvas was originally trimmed into several sections to fit into their final positions. Several gaps between the canvas pieces are a testament to the challenges of fitting a flat canvas mural onto a rounded surface. Olin Conservation was brought in to develop a cleaning and stabilization strategy as well as to identify areas that might have been damaged and need minor-to-more-involved repairs. These skilled conservators created a four step process to clean and restore the artwork including: removing dirt, dust, and an existing layer of yellow varnish; repairing any canvas that was pulling away from the plaster; retouching any spots of missing paint; and applying a satin/non-glossy varnish to protect the mural and intensify the colors. The most striking new element harkens back to the original stage when it featured a decorative four-panel painted curtain. 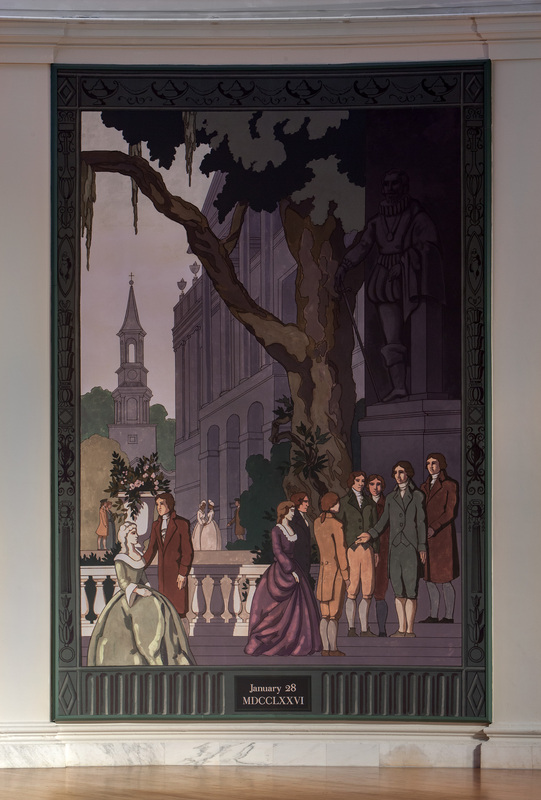 Those mural tapestries were designed by artist and architect James Monroe Hewlett and depicted scenes from four important cities of colonial times – Boston, New York, Philadelphia and Charleston. There seems to be no sign of what happened to those original curtains, but for functionality and durability reasons, producing replica curtains was not practical. Instead, the architects envisioned a modern alternative that allowed the existing circa 1990s acoustic panels to remain functional. After having an artist recreate scaled down versions of the original scenes from a mere handful of historic photographs of the curtains, Christman scanned the paintings and adjusted the colors to match the existing color pallet. Then, the four scenes were scaled to fit each 16 foot wide acoustic panel, printed, and then meticulously installed by being stretched over the acoustic paneling on the back of stage wall. We are so excited to celebrate the final product of the beautiful restoration of the Constitution Hall stage with all of you. A very special appreciation goes out to all of you who made this restoration possible thanks to your generous support of the President General’s Project. The results are breathtaking as I hope you can see from these photos and videos, and I look forward to many of you seeing it in person at Congress and for years into our future.